....maybe a new handbag to accompany you on your next date? And when hubby asks how much you paid for it, you can smile and say "not a dime!" Shari John, a stylist from Cents of Style, is giving away this gorgeous handbag to one lucky winner! It's called The Rosette and retails at $26.60. Its a black handbag with a pink zipper rosette! Cents of Style sells a variety of stylish fashion accessories (handbags, bracelets, rings, earrings, necklaces, shoes and hats) with prices starting at only $6.60. One: You do not have to spend a lot to look great! Two: When you look good, you feel good! Here is a little promo to save you some money! Use Promo Code: 0514 at checkout for 10% off and FREE SHIPPING! *The first 3 people to order with that promo code get a free centsible collection item with their order! Sweet Deal! Okay, on with the handbag giveaway! and leave comment with your email. 2. Post about this giveaway on Facebook and comment. Giveaway runs through Thursday, February 16th at midnight EST. This is such a cute bag! I am tired of using my diaper bag :(. I'm a follower, and I love this bag!! What a cute bag. I'm a follower. Love your blog more and more with each passing day!!! You're amazing! I have been a follower for a while! Your ideas are so cute, and I love your new blog too! I so hope I win this! Love this bag. I am in desperate need of a new one. 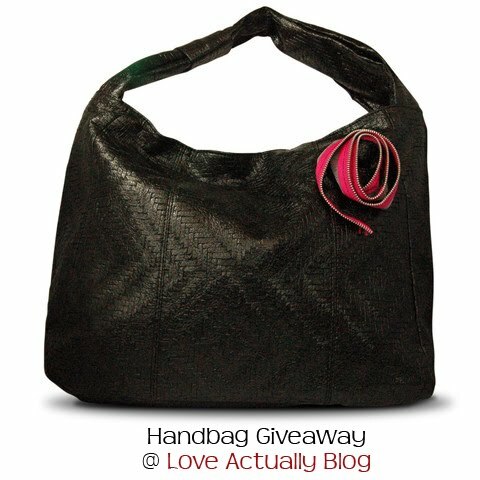 I'm a follower and who wouldn't want to win that cute handbag!? Thanks for the chance! what a perfect giveaway for valentine's day. I just posted about this on Facebook! Oh and I posted on facebook too! Oh yes please! I am in need of a new purse! I am a follower of Love, Actually. I am a faithful follower of Love Actually! I would love this bag! Every woman could use a new handbag, including me! I've recently decided I love handbags. I want this one!!! I also just posted about this on Facebook. Who doesn't love a good purse? What a gorgeous bag. I need a new one! I follow. I'm a follower and I love this bag! Because the ME in Mommy would love a sassy bag! What more is there to say? This bag is darling. I need to jump start romance with this!! Wahooo! Count me in for the give away! I like to have one! I am also crazy with bags! It would be even easier if the bags are for giveaways! This bag is so nice would love one!